Sweet moments of subtle comedy and straightforward family drama mix perfectly with Mike Mills' trademark artfulness in Beginners, his first dramatic feature since 2005's Thumbsucker. 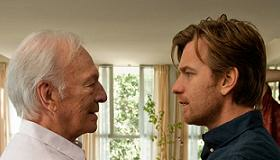 Hal Fields (Christopher Plummer) loses his wife at age 75 and announces to his adult son Oliver (Ewan McGregor) that he's finally coming out and "living the life" of an openly gay man. Just as Oliver comes to terms with his father's changing lifestyle, including a much younger boyfriend (Goran Visnjic), the 38-year-old graphic designer also learns his father has cancer. Helping Oliver come to terms with his changing life is Anna (Mélanie Laurent), a pretty French actress he meets at a costume party. But Oliver is bad with relationships no matter how much he may need one. Focus Features picked up Beginners at the Toronto International Film Festival, for a June 2011 release, the same window of time they released their 2010 hit The Kids Are All Right. Lacking the trailer-friendly gags and celebrity leads of Lisa Cholodenko's film, Beginners will fall below the $20M earnings mark of Kids Are All Right. Still, strong reviews, good word of mouth and an enthusiastic embrace from the gay community will help push Beginners far past the $1.3M earnings of Mills' previous drama Thumbsucker and make it a likely arthouse hit for summer 2011. Mills based Beginners on his own father who came out at 75, and the movie does justice to his tender family story. Mills' family may be unique but his screenplay emphasizes the universal themes that unite Hal and Oliver to many parents and children. There's the precious chance for an adult child to truly get to know one's elderly parent. There's also the solemn reality that sometimes the relationship between a child and parent ends when it's at its best. Fresh from his standout performances in The Last Station (playing Tolstoy, no less) and Terry Gilliam's wonderful fantasy The Imaginarium of Doctor Parnassus, Christopher Plummer shows strength, spirit and wisdom as a dying man committed to living honestly for the remaining days of his life. As the devastated son, Ewan McGregor offers a tender alternative to his trademark comic performances. The 39-year-old Scot connects perfectly with Plummer and their scenes together provide Beginners with an honest sense of family and loss. Strong support comes from Mélanie Laurent (Inglourious Basterds) and Goran Visnjic (TV's ER) but the spotlight remains on McGregor and Plummer and their scenes together. Clever touches from Mills include Hal's Jack Russell terrier Arthur communicating with Oliver via subtitles and Oliver's stunning graphic design work (a nod to Mills' other profession). Working with cameraman Kasper Tuxen, who shot the stunning 3 Backyards, Mills makes beautiful use of the Los Angeles backdrop, and editor Olivier Bugge Coutté makes artful use of the film's parallel storytelling and frequent flashbacks. Beginners is just Mills' third feature after 2005's Thumbsucker and his little-seen 2007 documentary about depression in Japan called Does Your Soul Have A Cold? And Mills' many fans know that, like David Lynch and Anton Corbijn, he's an accomplished artist that also makes movies. With Beginners, even more so than Thumbsucker, Mills proves to be an excellent storyteller and a master of melodrama. Now, that's a renaissance man. Release Date: June 3 ltd.